Last weekend I was attending a Halloween party and we were discussing the wall art at our friends’ house. Outside of their kitchen they had some framed prints of the early jazz era. Knowing that I’m not very knowledgeable about this part of history, my fiancé bet me that I couldn’t figure out who one of the pictures was of. The picture, which is fairly infamous, was of a woman in profile as she was singing. Erin didn’t say I couldn’t use my phone, so, having never used the program before but knowing of it, I loaded up Google Goggles. 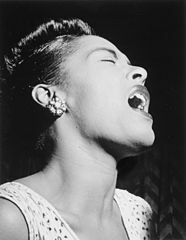 In less than 5 seconds, Goggles had pulled up images searches as well as music album results for Billie Holiday. It was particularly incredible because all of the people standing around us were amazed that such a program even existed. This goes to show you that many people aren’t even aware of how advanced technology has gotten and how easy it is to find answers and get information. Image the augmented reality capabilities of such technology. Imagine if you were wearing contacts that were able to pull this information from what you were seeing on the fly and show it to you without anyone knowing. Imaging if you were in school taking a test and your contacts were silently delivering the answers (ok maybe this isn’t a good application). At any rate, thanks for helping me win a bet Goggles!